When Orion star people meet Earth stone people - art of eternal value is created. During the transformative millennial Jupiter-Pluto con-junction in the Galactic Center December 2007, St.Clair [guided by ET intelligence] designed and crafted a stunning series of high-powered Orgone generating instruments - timed to his astrological knowing. These consciousness tools are priced in the range of 900 euro to 7,500 euro depending on size and the materials used. Click images to view enlarged details. 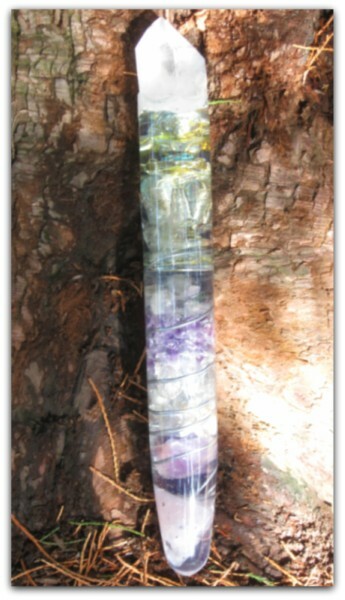 St.Clair designed these orgone tools for sending magical messages and receiving Cosmic energies of intelligent guidance. The frequency antennas were exposed to full moon lunations while completed to capture the sidereal power of the Orion stars and planet Mars. The master astrologer knows better than anyone when to harness the adequate star power, creating fine instruments of divination. The first series carry the signature of "Capricorn One" - the alignment of Jupiter, Sun, Mercury and Pluto, in 2007 & 2008. When you meditate and look with centered stillness into the crystal antennas, you will see the extra-terrestrial messages coming into your inner silent mind - forming images akin to the mirror of Galadriel. You perceive at that moment the purpose and direction of your life. Thought and thinker are one. From this realization you begin to interact with your guidance from beyond time. Holding the tool of consciousness, you can connect to your future self. These radiant Nuclear Resonators - some of the transmitters are small six inch tools for hand-held use, fitting in a pocket, while others are statuesque and up to twelve inches long - tools for psychic protection during the upcoming earth changes. 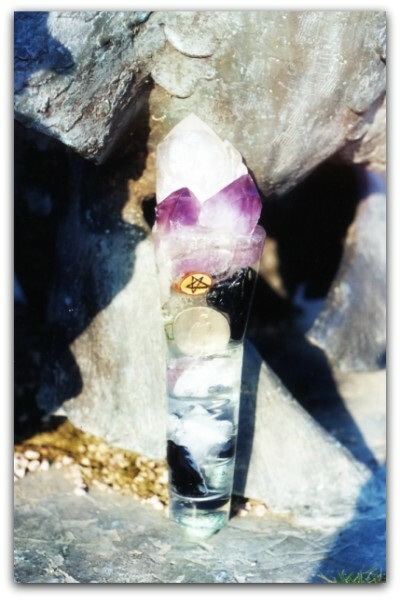 St.Clair uses massive two and a half inch (6cm) amethysts and European mountain crystals as tips, adding designed Runes with magical meaning to both protect the owner and give the user the self-empowerment necessary to project positive energies of prosperity and spiritual balance. 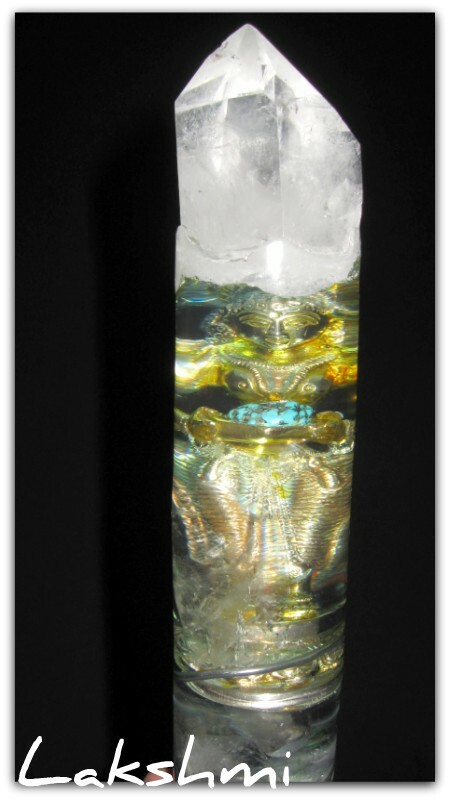 St.Clair's Crystal Zen Art is a quantum field that conveys peace and stability. Each piece is unique and cannot be replicated. All resonators displayed here are for sale - except the monumental piece displayed below, which is a "prototype" used to charge up the smaller astro-antennas. St.Clair also manufactures tools in design discussion with his clients, specific to their wishes. St.Clair crafted one super resonator inside a heavy crystal glass vase, sized 13 inches (33cm) high, and 6 inches (15cm) in diameter. It is filled with turquoise, rose quartz, two massive obsidians - the seeing stones - and with about forty fist sized crystals and amethysts, all serving as clean and clear energy transmitters. He integrated into this sculpture seven Runes - the ones displayed in his book Zen of Stars - and other silent power objects; he added a mobile dowsing instrument, plus gold and silver to the construction - at the feet of a brass Buddha who towers above the crystal mountain rock structure. The Oriental smiling sage and Master of The Tao confers confidence during the world planetary alignments coming up as Pluto moves through Capricorn until 2024. This nuclear super-resonator is absolutely unique and emanates the power of the world's leading astrologer and seer. St.Clair uses this Galactic Center Sculpture to charge all the antennas he creates for his clients. This is done in his contact with the invisible world - as discussed in his new book FORESEEN . . . The eternal construction by St.Clair is a portent of peace and signals a well-balanced life. The large scale nuclear resonator makes for a beautiful art object at home or in the office, and gives the owner a most efficient psychic orgone protection field - hundreds of yards in diameter of the location the resonator is used. 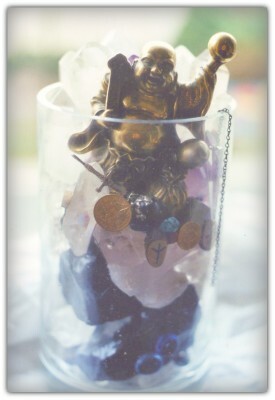 Lakshmi - Goddess of Fortune Light Crystal - "Time Travel is priceless." The creation of these magical quantum field tools was inspired by St.Clair's careful observation of both his clients needs over time, and by the astrological alignments in effect. The one alignment he used (Jupiter aligned with Pluto in the Galactic Center) will never be seen again in over 200 years. The objects are designed for private and peaceful use. 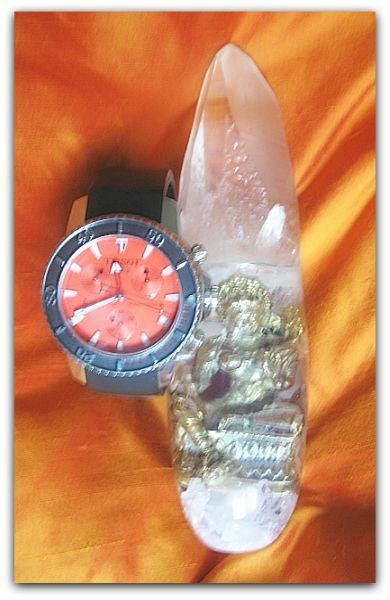 They make for a fantastic gift or for a harmonious & health orientated life. Michael St.Clair cautions his clients and the buyers of these art objects to visualize positive and peaceful outcomes when using the instruments. These resonators have helped to change the life of some of St.Clair's clients for the better when used appropriately. We experience real freedom, only when we don't want to avoid what we are actually experiencing. 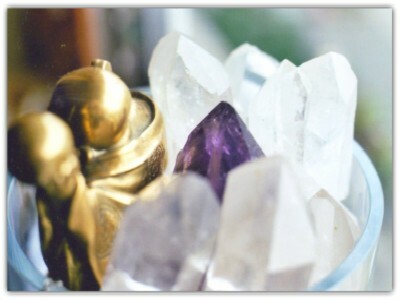 St.Clair's magical tools help to be aware of this fact of life when you connect to the star and crystal energies. The next series of nuclear resonators was created by the master astrologer inside the Cancer Full Moon of the 2007/2008 Winter Solstice when Mercury, Sun, and Jupiter aligned next to Pluto in Capricorn One. This degree is known in Sabian symbolism as "The Native Leader Takes Magical Power in front of His Assembled Tribe." "I've known for some years now that I will be building numerous of such energy fields to be placed in specific locations around the property." "They're just beautiful (aside from being functional)! Great job!" "I just wanted to tell you how BEAUTIFUL these crystal resonators are... it activates something and I don't know how to express this exactly, but something is happening to my energy field. They have such distinct personalities almost... it's like you have some invisible friends with you." St.Clair - leading mundane astrologer - writes indepth yearly personalized horoscopes, based on his clients or nations charts, using an advanced seer astrology, steeped in Cosmic knowing. His intense work, a tool of The 13th Consciousness Activation, designed by his NewMind Technologies consulting group, serves as guidance and cosmic positioning system. His reputed web sites passage11.com & zenofstars.org - consulted daily by thousands of surfers - are beacons of light on the internet sea; both feature his credited radio and video interviews. 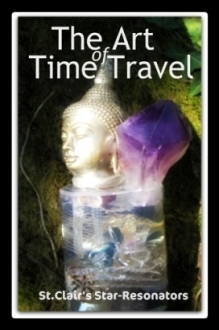 A stunning booklet about St.Clair's time travel tools was published in 2008.